If you want something done, ask a busy person to do it. 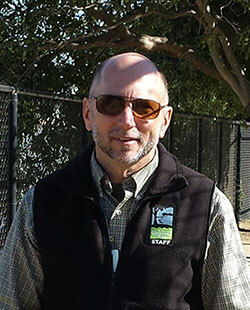 Steve Cismowski was already doing his regular job as Park Service Area 2 Manager, managing dozens of parks on the north and east sides of the county, when he also assumed interim management oversight of Park Service Area 5 (PSA5), which includes Upper Noe, Eureka Valley and Glen Park rec centers as well as numerous other properties. Normally, PSA5 is a big responsibility by itself but with the Glen Park Rec Center renovation project, it is especially so. All told, he now manages a vast expanse of 70 some odd properties with 70-80 Park employees. Steve is up to the job though. With a degree in landscape architecture, he joined RPD as a gardener in 1997 and he has progressed up the chain. His vast experience is our fortune. "Everything consumes all of my time. It is a mixed blessing. I tend to pay very close attention to detail. Every project is pulling at me for attention at this point." He makes the time, though, to meet with community leaders and do walk-around inspections of the parks, noting the long-range goals and the short-term necessities. It has been five years since the Upper Noe renovation. With maintenance issues arising, is there a plan? "The goal is to have a specific operations plan for each facility,” says Steve. Volunteerism is a return on investment according to Steve. “The City needs to communicate with organizations that support our operations and provide the critical work that we cannot get to.” He wants to improve identification of the tasks, the priorities, and the gaps so that willing community members can take care of maintenance before it becomes an issue. Small things help, like pulling Ehrharta grass from ivy or just clearing the sidewalk of leaf litter so the place is attractive. “Our focus tends to get pulled to hot maintenance issues, things volunteers can't do, like maintaining the ball diamond or irrigation systems.” Unfortunately, that often leaves a garden to fend for itself. Opportunities exist for minor pruning, weeding and mulching that help keep the park system alive while we are facing these drastic shortages. Registration opens at 10am on Saturday, March 1st. View spring courses online starting Feb 3. New to the schedule for Upper Noe is Girls Basketball for ages 5-13 on Wednesdays from 4 - 6 p.m. Register for classes at Upper Noe. Registration opens at 10am on Saturday, March 15th. View day camps online starting Feb 10. Saturday, February 15 from 10 to noon. Mid-20th century pop, rock and folk standards -- Everly Brothers, Simon & Garfunkel, Buddy Holly, etc. -- performed by two energetic and talented young San Franciscans. 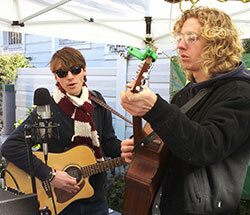 Sam Faustine is studying opera at the San Francisco Conservatory; Zak Mandel-Romann is a founding member of Tumbleweed Wanderers. 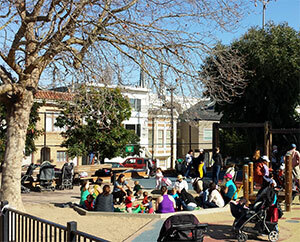 After wrapping up a banner year of activity in 2013, the Upper Noe Community Recreation Council (CRC) is preparing more fun, frolic and friendship activity. May 17 will be a History Day event featuring music, arts and crafts, food, and much more. While the event will celebrate local history with memorabilia, timelines and such, the focus is on community and forming shared goals. The council welcomes everyone. The next meeting is Wednesday, February 12 at 7 p.m. in the rec center auditorium. Under a tree barren of leaves, kids and parents make the most of the warm, dry weather. So far, the lack of rain has not affected the park’s plants. While an upcoming drought management plan has been hinted at, Rec & Park General Manager Phil Ginsburg on Jan 27 stated that Rec & Park is not taking action on the drought yet but urges everyone to conserve water use at parks. Upper Noe Neighbors is just one of the local organizations that takes advantage of the rec center to host community meetings. 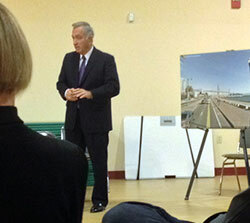 Neighbors recently came together to hear Art Agnos speak about the proposed Warriors arena on the waterfront and to discuss their opinions on the subject. 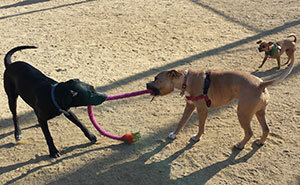 Micro a nd Daphne are locked in a challenging match of tug-o-war while Aden referees. An annual smart phone scavenger hunt in Noe Valley. All money raised goes toward improving the tech infrastructure at Alvarado Elementary, James Lick Middle School, and Marshall Elementary.